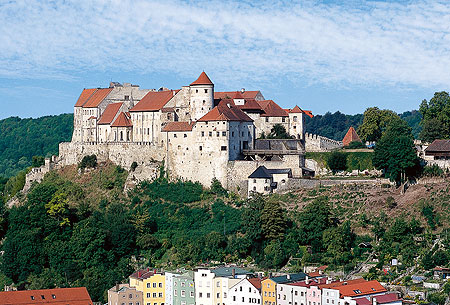 Burghausen Castle, with almost all of its medieval fortifications still intact, extends over a length of more than 1000 metres and is one of the largest castle complexes in the world. From 1255 on it was the second residence of the dukes of Lower Bavarian and the court of their consorts. In the late Middle Ages Duke Georg der Reiche (George the Rich) turned the castle with its six courtyards into the strongest fortress in the country. In the historic Great Hall (Palas) are the ducal apartments and the castle chapel dedicated to St Elisabeth. The Porter's Lodge is suitable for banquets, receptions and civil weddings up to 60 persons. The Knights' Hall is suitable for banquets, receptions, concerts and exhibitions up to 200 persons. The Gothic Hall is suitable for exhibitions (otherwise only in connection with the Dürnitz or the castle courtyard) up to 99 persons. The St Elisabeth's Chapel is suitable for weddings up to 100 persons. The St Hedwig's Chapel is suitable for for weddings up to 110 persons.